I am pleased to announce that we will be hosting Dom Raso and Dynamis Alliance for Combative Pistol I September 25-27. 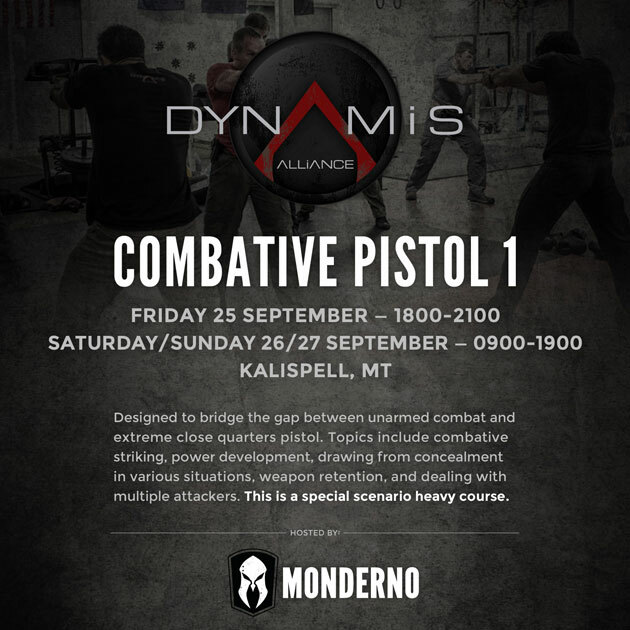 The course will be held in Northwest Montana at the Krav Maga gym in Columbia Falls. This course will teach you the skills required to fight inside “spitting distance,” where most altercations occur. We will teach you simple, yet brutally effective, unarmed combative skills designed to counter common attacks. We will also incorporate the handgun in these situations. To test your skills, we will put you through realistic scenario training using marking cartridges. This is NOT a typical shooting course and will be physically demanding. This is the only way to ensure that your skills will work when your life depends onÂ it. This will be a special SCENARIO HEAVY course. We extended training time to run through more scenarios. The course fee is $600 and covers all 3 days of training. You can sign up at DynamisAlliance.com. If you would like to travel to NW Montana to attend this class and need travel information,Â contact me and I’d be happy to help. Hope to see you there!